Besides your antique furniture, Attwill's Furniture Polish is a musician's secret for their treasured stringed musical instruments. Attwill's Polish nourishes and preserves the wooden components of these priceless instruments. Be sure that your name, address, and phone number are printed clearly. Furniture cleaner is priced at $25.00 per bottle. MA residents please add 6.25% sales tax. 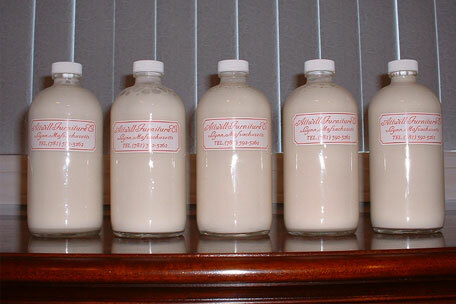 Shipping and Handling charges are calculated with a $10.95 base plus $3.00 for each bottle ordered. Take J. Sanger Attwill Furniture cleaner and shake well. Apply polish sparingly to a clean, dry rag. Take a second clean, dry rag and rub furniture to dry excess polish. Take the rag after use, rinse thoroughly. If not thrown away, wash rag separately from your household laundry. "Remember - a little goes a long way."